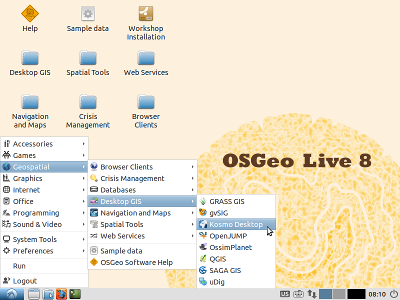 Version 8.0 of the OSGeo-Live GIS software collection has been released, featuring over 50 open source, standards compliant geospatial applications. We have moved from Xubuntu to the lighter Lubuntu base operating system, which starts up faster, requires less RAM, and uses less disk space, making it a better choice for running in a Virtual Machine or from a LiveDVD. We have upgraded to the latest 14.04.1 stable Long Term Support (LTS) release. LTS releases are put out every 2 years by Ubuntu. We have steadily been moving more of our projects to .deb packaging, which makes it easier to install programs on debian based systems such as OSGeo-Live, and allows application of post-release fixes if required. 34 geospatial programs have been updated to newer versions. LISAsoft provides sustaining resources and staff toward management and packaging. The DebianGIS and UbuntuGIS teams provide and quality-assure many of the core packages.